Washington Republicans tightened pressure Tuesday on Alabama's GOP to keep a defiant Roy Moore from being elected to the Senate next month, with many voicing hope that President Donald Trump could use his clout to resolve a problem that Republicans say leaves them with no easy options. "He's obviously not fit to be in the United States Senate and we've looked at all the options to try to prevent that from happening," said McConnell, who Monday said he believed Moore's accusers. "This close to election, it's a complicated matter.'" 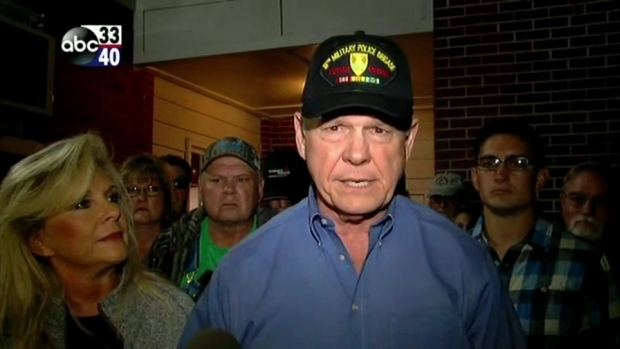 Speaking Tuesday evening at a revival service in a Baptist church in Jackson, Alabama, Moore said there is a "spiritual battle" going on in American politics as he faces mounting pressure to drop his bid for Attorney General Jeff Sessions' former Senate seat. Moore made only passing reference to the sexual misconduct allegations enveloping his Senate bid. As he has done at other stops, he suggested the allegations were an effort to stop his political career. Moore asks: "Why do you think they're giving me this trouble? Why do you think I'm being harassed in the media and people pushing for an allegation in the last 28 days of the election?" Moore has denied abusing the women but has not ruled out dating teen-agers at the time, when he was in his early 30s. Attorney General Jeff Sessions told Congress he has "no reason to doubt" the women. Sessions, a former Alabama senator and still one of the GOP's most influential voices in the state, didn't rule out a Justice Department probe of the allegations, telling the House Judiciary Committee, "We will evaluate every case as to whether or not it should be investigated." Alabama Republican Senate candidate Roy Moore says the latest sexual misconduct accusation against him is "absolutely false." 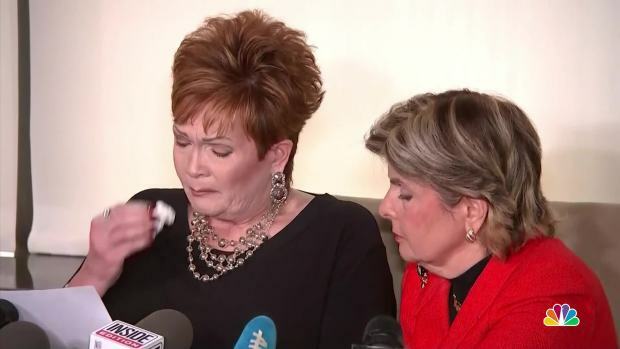 On Monday, Beverly Young Nelson Moore said Moore assaulted her in the late 1970s, when she was a 16-year-old waitress. 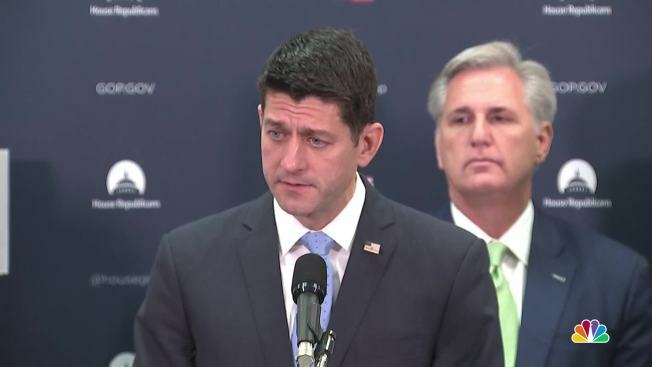 House Speaker Paul Ryan joined the pile of congressional Republican saying Moore should drop out. "These allegations are credible," Ryan, R-Wis., told reporters. "If he cares about the values and people he claims to care about, then he should step aside." Two Washington Republicans, speaking on condition of anonymity to describe private conversations, said they didn't know what Trump would do, but said the White House shares McConnell's concerns about Moore. While few think Trump could persuade Moore to step aside, several are hoping he can convince the Alabama state party to take some action. 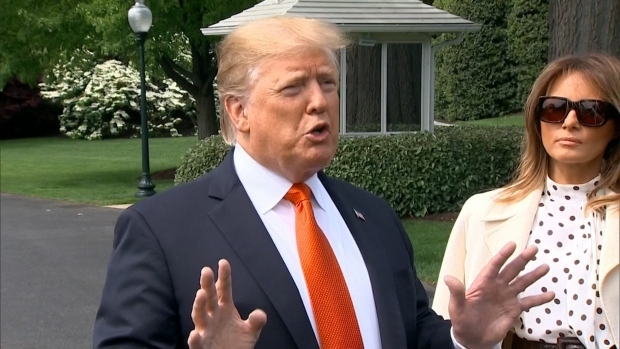 At a forum Tuesday organized by The Wall Street Journal, McConnell said Trump is discussing what to do in the Alabama race "in great detail." With a political brand as an unrepentant outsider, Moore has signaled no intention of dropping out. Underscoring his defiance, he tweeted Tuesday, "Alabamians will not be fooled by this #InsideHitJob. Mitch McConnell's days as Majority Leader are coming to an end very soon. The fight has just begun." Despite the building pressure from national Republicans, state GOP office holders have taken a measured response or avoided commenting on the accusations against Moore. It's already too late to remove his name from the ballot. That leaves the state party with limited options. The 21-member party steering committee could vote to revoke Moore's GOP nomination and ask election officials to ignore ballots cast for him Election Day, but that would risk a lawsuit and backlash from Moore supporters. The party has little interest in alienating Moore's followers a year before elections in which the governor's office and entire state legislature will be in play, but it remains possible. In an interview, Moore campaign chairman Bill Armistead said he'd seen no indication that the state party will "back off in any way." He said some in the party want it to pass a resolution embracing Moore. A spokesman for GOP Gov. Kay Ivey reiterated that she would not postpone the election to give Moore's opponents more time to organize. 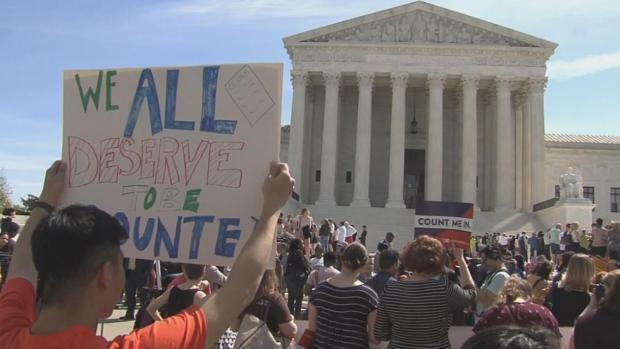 That would spark a legal challenge, but a possible delay remains an option, Republicans say. McConnell praised Sessions Tuesday as a possible contender who is "totally well-known and is extremely popular in Alabama," but he conceded Sessions might not choose to run. Sessions held the Senate seat he held before joining Trump's administration this year. Some Republicans said they believe Sessions is reluctant to run but expressed hope that Trump — who's soured on him after he appointed a special prosecutor to investigate Trump's 2016 campaign's ties to Russia — might urge him to run. Republicans think GOP Sen. Luther Strange, whom Moore defeated in a September party primary, would have little chance against Moore. Strange has said such a move is unlikely. If Moore is elected, top Senate Republicans already are threatening to vote to expel him as soon as he's elected. But that risks leaving the seat unfilled for a period of time.